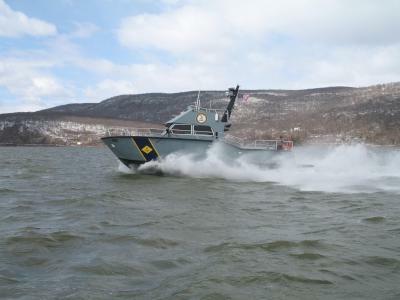 In late September the NY Naval Militia, under Commander Don McKnight launched their PB 400 marine patrol boat which had been out of the water since June undergoing repairs. The 40 ft. boat made by MetalCraft Marine was coated with HullSpeed.us™ 3000-Series bottom coating in August. The new bottom coating, which is designed to improve speed, fuel economy and ease of hull cleaning was applied by roller over traditional epoxy barrier coat during the repairs. HullSpeed.us™ technology creates a hard and durable, slick foul release surface. HullSpeed.us™ coatings are water borne silicone-epoxy paints that contain no heavy metals or biocides and meet the stringent requirements of the California Air Research Board(CARB) VOC(volatile organic compounds) regulations. Project manager and boat operator Senior Chief Frank Rodgers said he could feel and see a noticeable difference in acceleration, top speed, and the accelerated ability get on plane. Rodgers was also excited about working with a water-based, pro-environment paint. HullSpeed Performance Marine Coatings have been working with NYSERDA(New York State Energy & Research Development Authority) funding to develop the commercialization of the products. It is the goal of HullSpeed.us™, a subsidiary of Greenfield Manufacturing Inc., to employ the NYSERDA funding to create more jobs for NYS while positively influencing the marine industry and reducing its carbon footprint. This is another example of how small business, especially small business in NYS, can sustain green initiatives, growth, development and a positive outlook for the future in a difficult economy. For more information please visit www.hullspeed.us. SARATOGA SPRINGS, N.Y. -- Greenfield Manufacturing Inc., a Saratoga Springs chemical manufacturing company, has received New York State Energy Research and Development Authority (NYSERDA) funding of $183,000 to help commercialize and deploy a high-tech hull coating that can improve boat engine efficiency by reducing friction. HullSpeed High Performance Coatings, a division of Greenfield, produces eco-friendly alternatives to current marine paints and coatings that can be environmentally harmful. Greenfield was established in 1998 as an industrial chemical manufacturing facility. The company matched NYSERDA’s investment.